Make birthday cards in a flash for kids of all ages with these fun stamps! Stamp Make a Wish messages in black ink on white card stock. Stamp again in black on pink. Cut out words only from white. Mount onto pink. Trim edges and mount to Cantaloupe card. 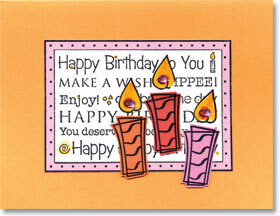 Stamp candles in Crimson, Sherbet, and Blossom card stock. Stamp the flame image on white and color with marker. Mount and embellish with Pink gemstones. This make a wish message makes a great card in five minutes…make a bunch in different colors! Add whimsy to a birthday message with a cute tilted crown. 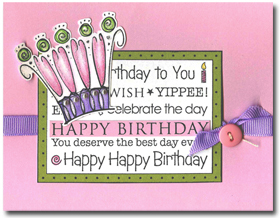 Stamp the birthday message with black ink three times, once on white, again on pink and lastly on lime cardstock. Cut out the entire image from the lime cardstock. Cut out the message omitting the outside border from the white. Cut out just the Happy Birthday strip from the pink. Stack the message back together and adhere in place. Stamp the crown on white cardstock, color with pencils and trim. Wrap green ribbon around a pink notecard and secure with a knot. Tie on a button with string. Adhere the message and crown to the card. Add stickles and pearls to the crown to finish. Layer the same image with a combination of color cardstock. Use this paper piecing technique to create a bright fun-filled birthday greeting. Using Soft Pool ink, stamp Raindrop background on the top two thirds of a Baby Blue card and Houndstooth Background on the bottom third. Be careful not to overlap too much. Using a green ink, stamp Make a Wish Messages on Lime cardstock and trim off the border. Attach it to a slightly larger piece of white card stock. Isolating the words Happy Birthday on the fourth line, stamp the message stamp again on blue pattern paper. (Use tape to cover the surrounding areas you don’t want inked up. Ink the words. Remove the tape before stamping.) Trim a 4 ¼” long strip. Place the strip so that it covers the same words on the green piece. Adhere it all to the card front so that the strip covers the area where the two backgrounds come together. Add three smooth gemstones to the strip. 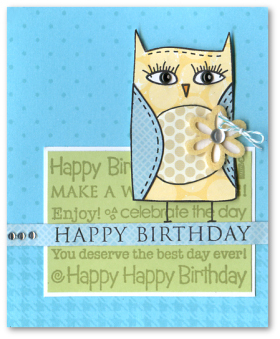 Stamp the owl on the blue and yellow pattern papers and again on white cardstock. Cut out the wings from the blue, the eyes from the white and adhere them to the yellow owl. Add the tan pattern to the owl’s belly. Using a white Sharpie pen, add a white dot to the Midnight Black Accent Pearls for the eyes. Further embellish the owl with a flower made from a Felt flower a smooth pearl and string. Highlight a portion of a multi message stamp by stamping it again in a different color and layering it on top.